China's large passenger jet, the C919, took off in Shanghai Pudong International Airport at 11:38 a.m. and arrived at Xi'an Yanliang Testing Base, Shaanxi Province, around 2:00 p.m. Friday, its first intercity test flight. With a crew of five onboard, the aircraft flew at a height of 7,800 meters during the journey of more than 1,300 km, according to Commercial Aircraft Corporation of China (COMAC), the Shanghai-based manufacturer of the jet. The C919 will remain at Yanliang and undergo more testing to acquire its airworthiness certificates. The jet made its maiden flight in May and has now completed six flights in total. COMAC plans to produce six test aircraft, with the second expected to make its maiden flight at the end of this year. The company has orders for 730 C919 from 27 clients. With a standard range of 4,075 kilometers, the C919 jet is comparable to the updated Airbus 320 and Boeing's new generation 737. 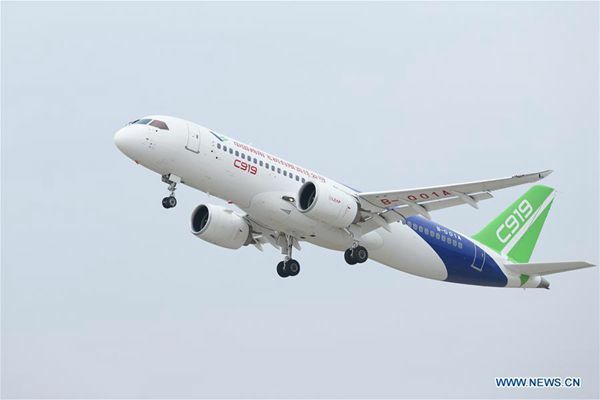 The Chinese-produced large passenger jet, C919, started its first long-distance test flight on Friday morning.